While I continue to work on my SWTOR class reviews proper, the summaries for all of the various class stories are pretty much done. I decided to tackle yet another project. With the launch of Final Fantasy XIV: Heavensward, I realized how many people were probably coming back to the game and that with as much space as there is between patches, some folks may not recall exactly what happened in the story leading up the expansion. Especially since Final Fantasy XIV significantly expanded the main scenario storyline with each patch. So I thought, how about a summary for that too? Announcing the Realm Reborn Story Summary! Unlike the SWTOR story summaries, this one is chock full of SPOILERS, so be warned before reading down the page. After all, the SWTOR page was mostly designed as a spoiler free way of seeing if the storyline would interest you before sinking 50 levels into the narrative but Final Fantasy it’s more of a catch up/reminder tool. It’s heavily summarized so don’t expect too much in the way of a point-by-point quest-by-quest breakdown. It also assumes you have some familiarity with names and places in the world of Final Fantasy XIV. Though some reoccuring elements such as Hydaelyn and the Primals are explained somewhat. Anyway, I hope you Final Fantasy XIV fans get a kick out of it. It’s broken down by patch, so you can go and read just the parts you want. I plan to expand it into including stuff like the story for the raid content that is now kind of outdated with the expansion, so I don’t know if as many people will get a chance to see the AWESOME tribute raid to Final Fantasy III: The Crystal Tower or the lore filled bits of the Coils content. Long time readers know that I regularly flip back and forth between 2+ different MMOs for the sake of preventing burn out. Lately it’s been going back and forth between Final Fantasy XIV and Star Wars: The Old Republic. Two games that – while not perfect – are damn good at satisfying different cravings I have in games. Final Fantasy put me in a tight spot recently. I really REALLY wanted to see the conclusion of the Main Scenario before the 12x Experience boost went live in SWTOR, and finally climb over that damn Story Wall of Ishgard, but I ran into a block with what has clearly become the guardian of the story wall: The Steps of Faith. ‘Oh, Vry! The Steps of Faith isn’t hard if you know what to do!’ I hear the internet shout as a collective hive mind that I have somehow tapped into but retained my sentience from. Well, yes. It is a bit different, and all you really need is to know what to do, and guess what? I DO know what to do. I know exactly what to do. But apparently 5-6 other people in the Duty every time do not, and their struggle wears on other’s patience and it ends up with us standing in front of the dragon, unable to pull, because we are constantly in the queue trying to pull new members out of the magic hat. I REALLY want to finish that place, because I REALLY, REALLY, REALLY want to see what happens to the Sultana! So after a week of failed attempts, I just said screw it. I need some epic heroic time to cleanse the pallet of dying to this dragon over and over and came back to a galaxy far, far away. Mostly because I do have a job to finish there, and the 12x XP boost makes that job so much easier. I am kind of curious what the deal with Ziost is, as I have somehow managed to remain completely spoiler free on the plot there. 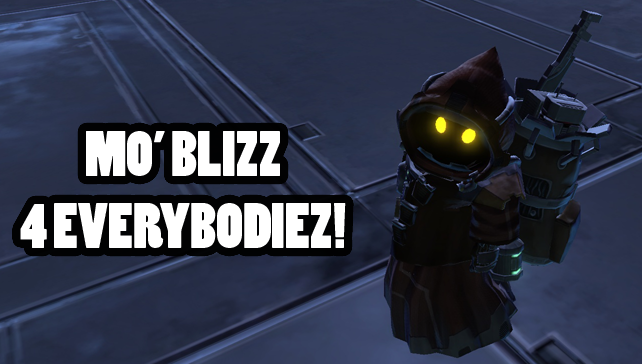 To which I must say, kudos SWTOR community for actually keeping a lid on things. Others could learn from your example. Although the first thing I did when I got back was grab up a few cartel packs, including the Grand Nightlife Pack which gave me a Dathomir Rancor. Not having any desire to ride piggy back on a monster, I flipped on the GTN (Auction House for those who aren’t familiar with SWTOR) for a cool cold 15 million credits, and officially netting me the most cash I’ve EVER had in the game. Combine that with Amazon’s sale for 14,500 cartel coins for $80 and I could get started the grand process of unlocking and decorating my strongholds. Because if I’m going to be building a bigger legacy, I need a place for them to crash. I hope to share some photos of them here soon, I think folks’ll be impressed. So what should you expect here on the Summer of the 12x XP? Well, hopefully to finish up all my class story summaries and reviews. That’d be my big goal. I’m looking forward to seeing some alternate character choices too. Especially the Imperial Agent. Finally, with my resurgence of interest in writing fan fiction in my spare time, I wouldn’t be surprised to see some short or flash fiction bits about some of my characters appear now and then. I do have an idea for the three brothers (Vrykerion the Bounty Hunter, Vrykarion the Jedi Knight, and Vrykerius the Sith Warrior) have a family get together over some cards to catch up. That might be fun. Regardless, there will be more reviews coming soon. Card Games on Chocobos? Triple Triad Arrives! Greetings gentleman and ladies! The time has come, and the doors are open to Final Fantasy XIV’s very old Gold Saucer. A fantastic homage to the mini-game capital of RPGs. Honestly, its probably the most excited and most fearful for a patch I’ve been in quite a while. The entire ‘personal housing is just guild housing without needing a guild and that’s all’ thing from a few patches ago had me fuming due to the poor implementation and outlandishly high barriers of entry (Level 50, highest rank with your grand company, and anything from 4-20 million gil depending on limited lot availability). Not to mention the whole real estate war for limited numbers of spaces. I’m still saving up. Wait… wasn’t I talking about the Gold Saucer? Yes, the Manderville Gold Saucer. Owned and controlled by Godbert Manderville himself. A statuesque man that you may know if you’ve done any of the Hildebrad quest chain at level 50 or from a disturbing series of quests at Camp Bronze Lake where you help attend to Godbert at the spa (*shivers*). 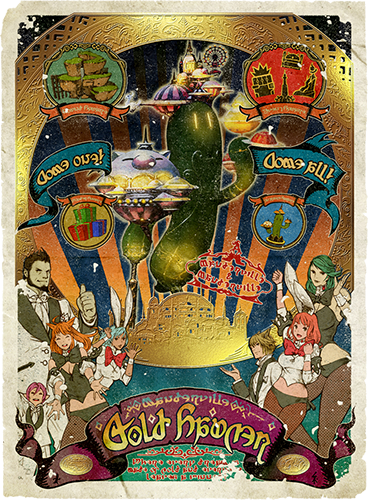 The Gold Saucer boasts several mini games, events called GATEs, tons of prizes to earn, chocobo racing and what I looked forward to the most: Triple Triad. Ah yes, the original card game in the Final Fantasy legacy. Triple Triad involves placing cards on a 3×3 grid and capturing your opponents cards by placing adjacent cards with higher values. The game originally appeared in Final Fantasy VIII and was one of the MANY heavily divisive features of the game. VIII even more than Final Fantasy VII was very much a ‘love it or hate it’ experience. There’s a LOT of hate for it out there, as noted by Noah ‘Spoony’ Antwiler’s scathing series of video reviews but there is also a ton of love for it too. I particularly enjoyed a good deal of the story and how much of the truth of the events being implied rather than directly stated. For instance, Squall & Rinoa’s romance ultimately being the culmination of the lost chance at love between Laguna – heavily implied to be Squall’s father – and Julia – Rinoa’s mother. Uh… I suppose spoilers for the 16 year old game? Wait. SIXTEEN? Yea. 1999. That’s right. FF8 is old enough to drive. Mind blown. Triple Triad was however is where it got frustrating. At the beginning of the game, Triple Triad is a fun side activity to collect cards and have fun playing. However, as the game goes on more and more rules are added to Triple Triad turning it from fun side activity into a nightmarish mess that will more than likely cost you every card in your deck. Oh yes, did I forget to mention that winner takes one or more cards from the loser? Meaning a bad streak of luck can leave you without your most powerful cards with only a chance that you can maybe someday win them back from whomever you lost them to, cause hey, there’s only one of some of these cards IN THE WORLD. So where am I going with all of this? Well, with the talk of losing cards to opponents, poor implementation of other promised features, and a heaping mess of confusing rules… can you blame me for being nervous about Triple Triad at the Gold Saucer? I mean, am I going to lose every card to some random person who has already grinded out the best cards in the game? Thankfully, I can say: NO. In fact, Triple Triad’s implementation is actually one of the most casual friendly, easy to get into, and enjoyably minimal risk side games I’ve seen in something bearing the Final Fantasy name. First of all, you can’t lose your cards. At all. Once you’ve unlocked a card, it is yours. So how do you get more cards? Well, there are lots of ways. The first way you’ll encounter is to defeat NPCs at Triple Triad. Each NPC that you can challenge at the Gold Saucer will have 1 or 2 cards you can win off of them. There’s also a ton of NPCs out and about in the world that have cards you can win off of. The cards aren’t a 100% drop and really it’s all RNG. My first card took about 10 wins, the second came 2 wins after. There’s also a chance for cards to drop from dungeons and trials and this is where I was really happy with how this was done. The cards are personal loot. That means there is no rolling on cards, no ninja-ing cards, no arguing about cards – just a chance that when the boss dies you and anyone who participated have a chance to get a card placed in your inventory. Oh geeze, thank you. I mean, yea. It’s not a guaranteed drop that everyone rolls on and I’ve seen some people complain about that, but this is so much less stressful. But Vry, I hear you ask, I heard you can only have 1 of each card unlocked. Wouldn’t that mean people would eventually not need to roll so everyone would get a card? No! I shout and bop you on the head. Because the final way to get new cards is to “sell” your duplicates at the Gold Saucer for points (Points being the universal currency of the Gold Saucer) so you can buy other cards you don’t have or trade in dupes to save up for that snazzy Setzer outfit (Btw, thank you FFXIV developers for all the awesome shout out love you give FFVI in this game. 6 is still my all time favorite and I eat up stuff like Ultros & Chupon appearing.) So yea, you pretty much ALWAYS have an excuse to want to roll on cards. Hence why personal loot is less problematic in my opinion. What about the confusing rules? Yea. Some of those squeaked in. Things like ‘Same’ where if 2 or more sides of a card match the numbers on the adjacent cards’ sides, all of them are flipped and captured. That’s actually one of the more simple variations. Still, the game at least will tell you what the rules are and a brief explanation beyond the name when you challenge someone. The worst rules from FFVIII were the ones that dictated which cards the winner got. Like you keep all the cards you flipped so even if you win, you still might lose a rare card or you just win your opponents entire hand of cards. But since you can’t take an opponents card, these rules don’t exist. The others, while annoying, are just about trial and error until you get the hang of them and learn to keep an eye out for your opponent trying to lure you into a trap. So without winning cards, what do you win? Well, you win gold saucer points. Also a chance for a card to drop. You also win half as many points if you draw, and a paltry sum even if you lose. This seems to be some consolidation for the fact that you have to pay points to play. There’s an ‘ante’ of sorts. If you lose you’ll get a portion of that ante back, but not the whole thing. My limited observation is about 75-80% of the ante is what you get on a loss. There’s also a nice system in place so you can’t just screw newcomers with overpowered decks. You are limited to how many high level cards you can place in your deck based on the total number of cards you have unlocked. Like at less than 30, you can only use one card of two-star rank or higher, and the rest must be 1-star rank cards. Between 30 and 59, you can use as many one or two-star rank cards, but only one of three-star rank and finally if you have over 60 of the total 80 cards unlocked, you can have as many 1,2 or 3 star cards as you want but only one card of 4 or 5 star rank. So you can’t just make an ultimate I-Win deck out of all 5 star cards. So is Triple Triad a success? Well, time will tell. The first tournament doesn’t begin until next week, and it’s only been around for a day but thus far I love it. I love that I don’t have to live in fear of losing my rare cards, so all I have to do is play and have fun with it. I played several dozen matches last night while watching YouTube videos (Shameless plug: Yes my YouTube channel is still up and running with more still coming in the render queue! Subscribe now!) and it was completely and unabashedly enjoyable. I highly recommend trying it out as a downtime activity while your chilling on your computer or waiting for the DPS queue to pop. Finally, there’s already an awesome site up and running called A Realm Reborn: Triple Triad that has all the cards listed and where you can find them as well as a breakdown of the rules with a quick tutorial on how to play. You can find that site here.